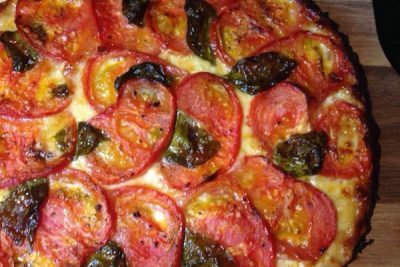 This simple Tomato and Mozzarella tart with basil recipe is unbelievably good, takes very little preparation, (unless of course you make the pastry yourself) and is a crowd pleaser! We serve this up sometimes as a little appi when guests are awaiting the grilled meat, it’s also great as a snack when having drinks or it can also be a great alternative to pizza. Put the cubed butter and flour together in a large bowl – make sure you sift the flour, and that the bowl you combine everything in is cold. Or throw it all in a mixer as I would usually do! Add a pinch of salt. Using your fingertips, rub the butter into the flour, bringing the mixture up to a height so that it collects air as it falls down into the bowl (this will ensure that your pastry isn’t heavy). Once you’ve reached a crumbly texture, add enough cold water – a tablespoon at a time – to bind everything together. You shouldn’t need much more than three tablespoons. Bring the mixture together into a ball, the pastry should be relatively dry, but the bowl should be clean of any residue once you’ve finished. Wrap your pastry ball in cling film and pop it in the fridge for at about half an hour. Preheat your oven to 190C/375F/Gas 5. Take your pastry out of the fridge and roll it out on a lightly floured surface, turning the dough 90 degrees every now and then to make sure it’s even. You should end up with a circular shape. Go around the edges twisting the dough to form a nice edge then prick the base all over with a fork. Cover the pastry a piece of grease proof paper and tip in some baking beans and bake for 20-25 minutes. It should be golden and dry. When that is done let it cool. Set your oven to 190C/375F/Gas 5 and then brush the tart with olive oil, then arrange the slices of mozzarella over the tart, then nicely arrange the tomatoes on top of the mozzarella, then sprinkle with whole basil leaves, season with salt and pepper and drizzle a bit of olive oil over the top and pop in the oven for 20 minutes or until it looks delicious like the above picture. Serve immediately hot or later cold, hot is the best way to go though!